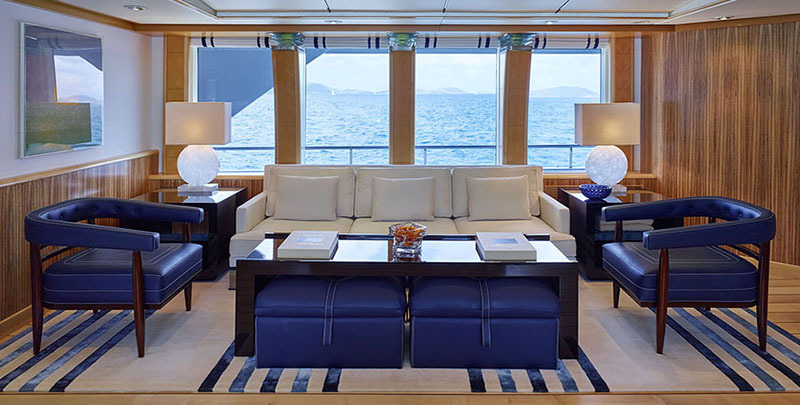 Main Salon: The light and airy salon offers delightful seating areas of leather upholstered sofas and armchairs coordinated with silk striped area rugs and crisp linen fabrics. 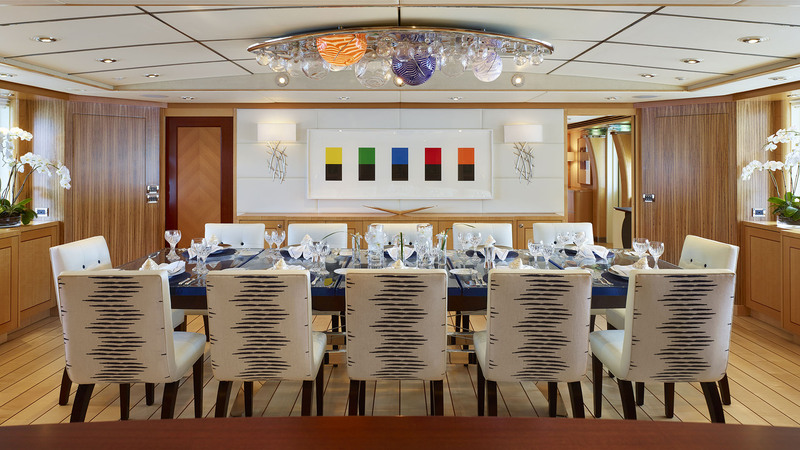 Main Salon: Seamlessly blending pop, surrealist and abstract, original works of art by Andy Warhol, Joan Miro and Elsworth Kelly grace the interior. 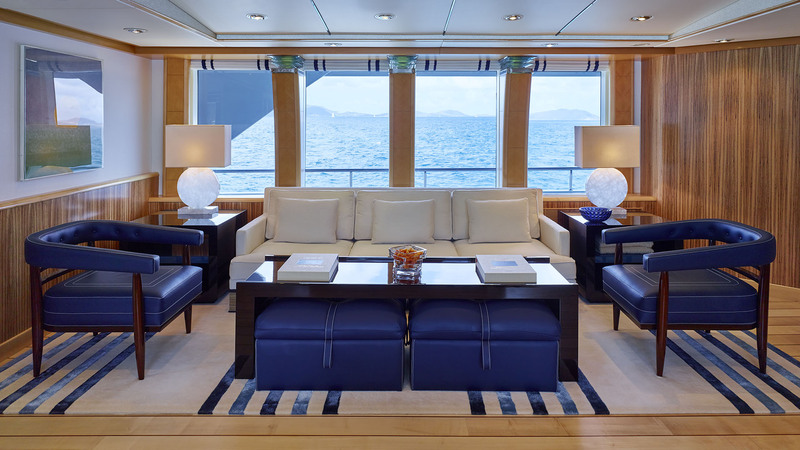 Main Salon: Victoria del Mar's owners worked closely with interior design firm Claudette Bonville Associates to execute this Alberto Pinto-inspired interior and create a smart and distinctive atmosphere throughout. 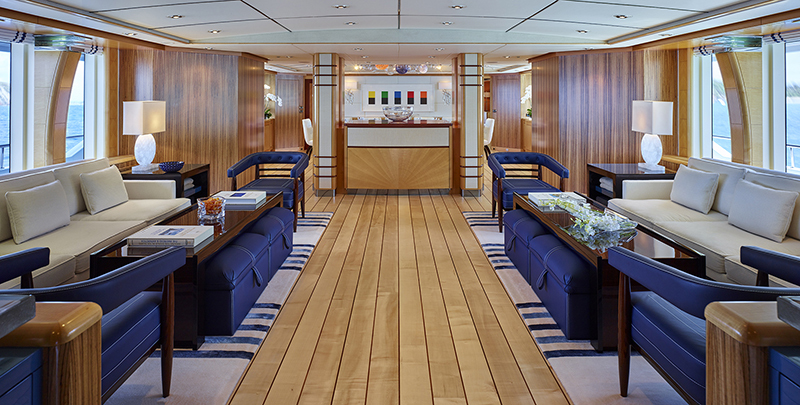 Main Salon: A recent refit expertly blended original pieces and woodwork with updated furnishings, floor covering and dÃ©cor. 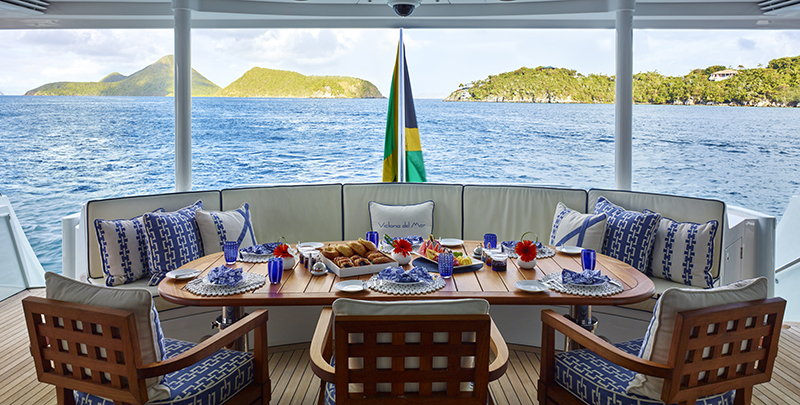 Main Aft Deck: The cool aft deck can be set up with a full table for a light breakfast or as a casual relaxation area with three small drinks tables. 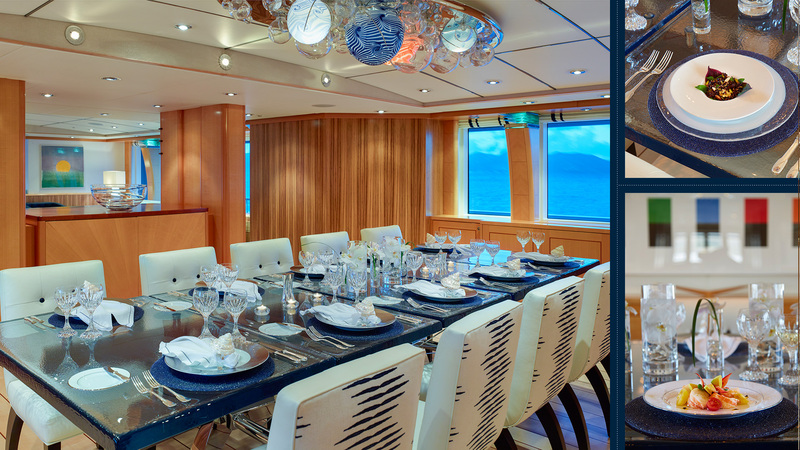 Main Deck Dining Room: Open to the main salon, the interior dining room features an exquisite glass table that comfortably seats 12. 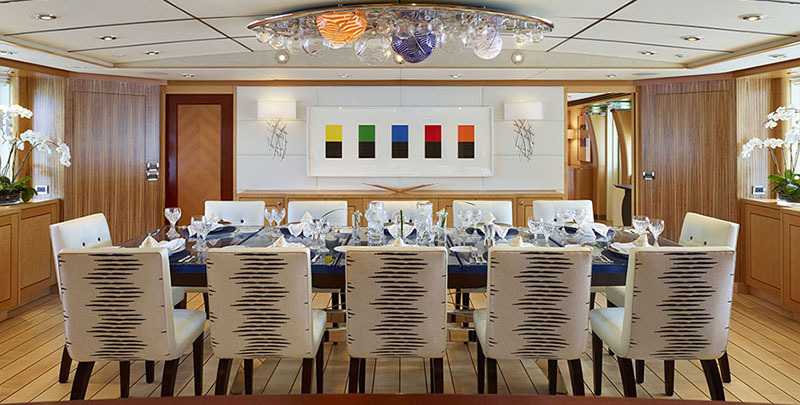 Flanked to either side by large windows, the formal dining table is graced overhead by a blown glass chandelier crafted by the Seattle artist Scott "Chico" Raskey. 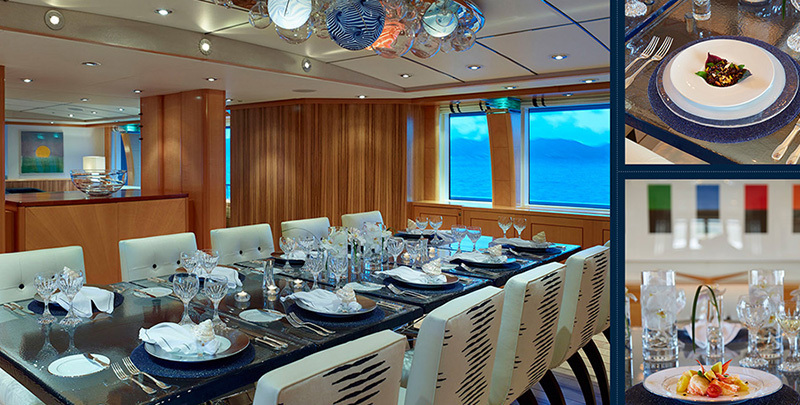 Main Deck Dining Room: Featuring a stunning glass table for 12 crafted by the artist Chico, the main dining room is highlighted by an eight-foot-long blown glass chandelier. 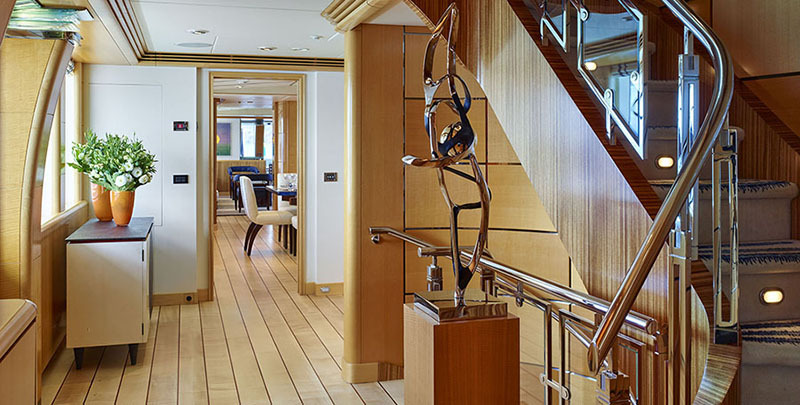 Main Deck Foyer: A graceful entryway welcomes guests onboard. 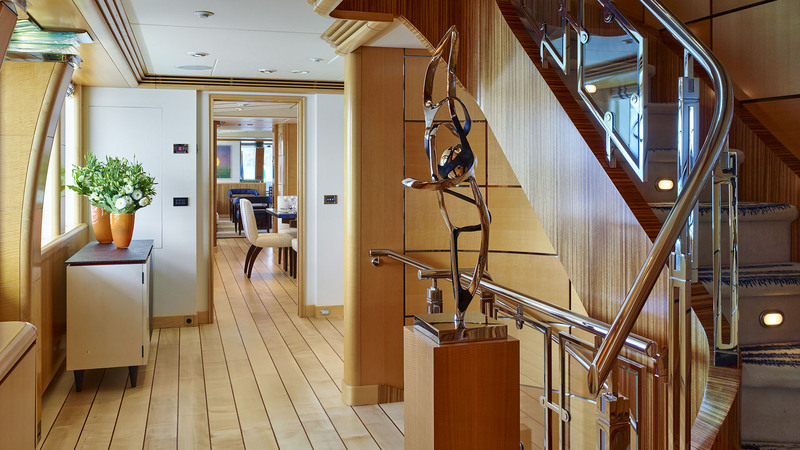 The unique main stairway of exotic anigre and zebra woods with accents of glass and stainless steel grants access to all four decks. 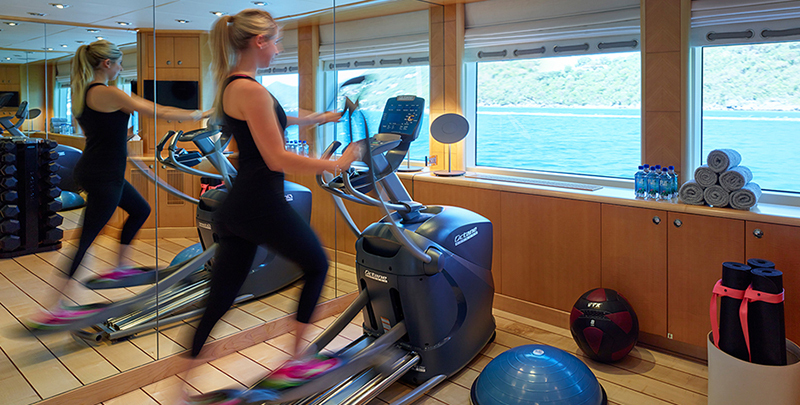 Taking the elevator is also an option. 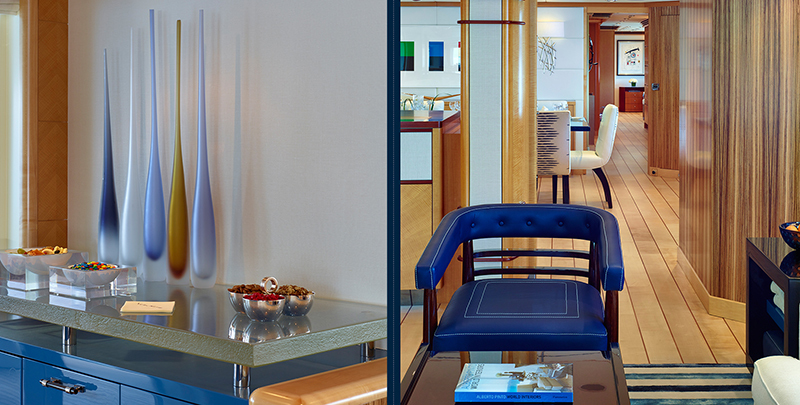 The details: The main foyer is graced with this original Alberto Pinto cabinet. 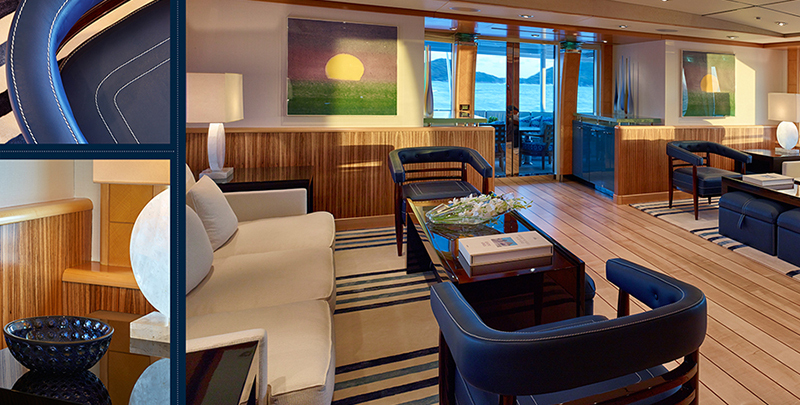 The Library: The main foyer leads into this library and sunny reading area forward to the gym and VIP staterooms. 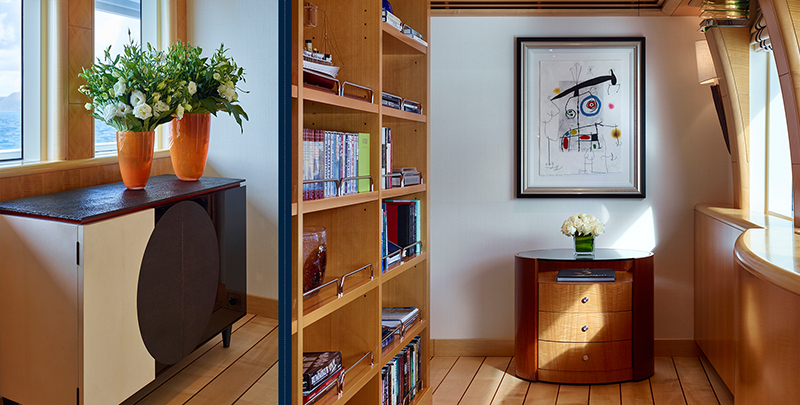 The Library: The main foyer is graced with this original Alberto Pinto cabinet (left) and leads forward through a sunlit library (right) to the gym and VIP staterooms. 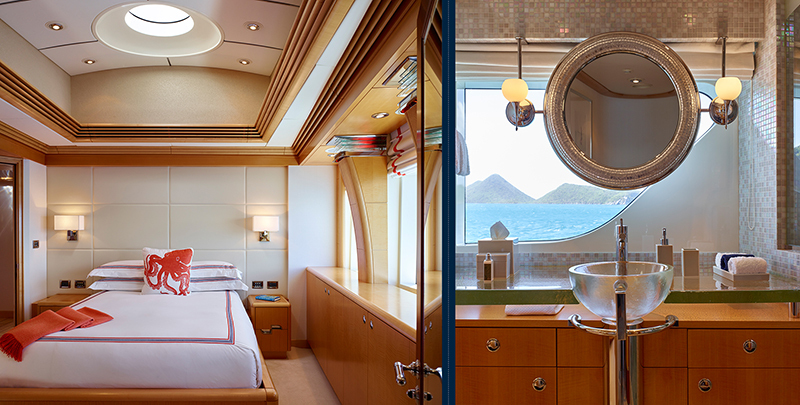 VIP Port Stateroom: Offering stunning views and exceptional space, the VIP staterooms feature walk-in dressing rooms, large bathrooms with full-size showers. 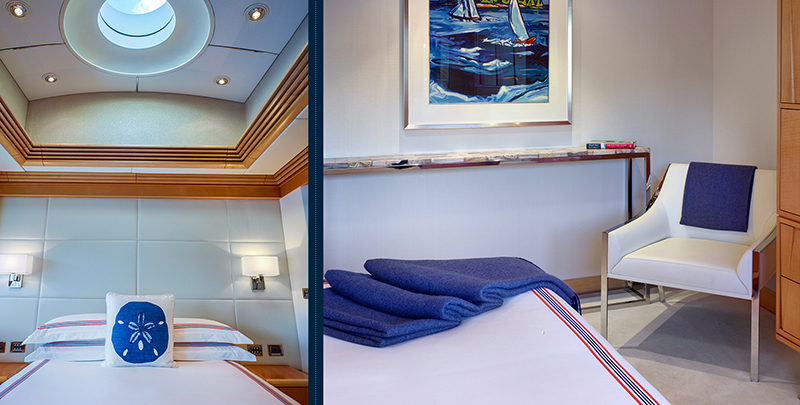 VIP STATEROOMS: Generous windows provide plenty of light and breathtaking views throughout the VIP staterooms. 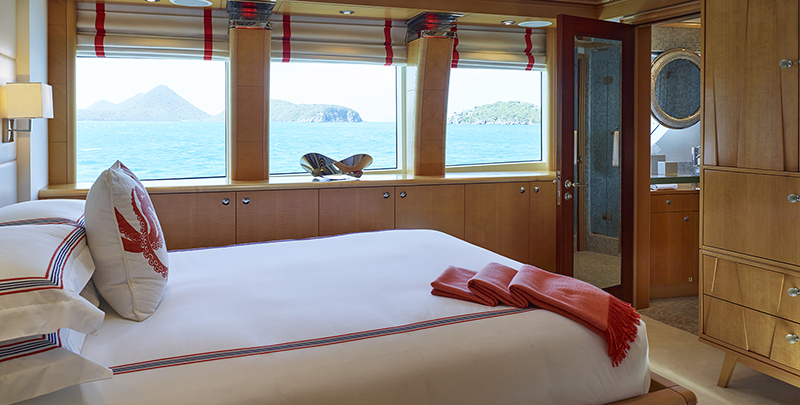 VIP Starboard Stateroom: Located forward on the main deck, the VIP staterooms offer guests generous 8-foot ceilings with skylights above the queen-size beds. 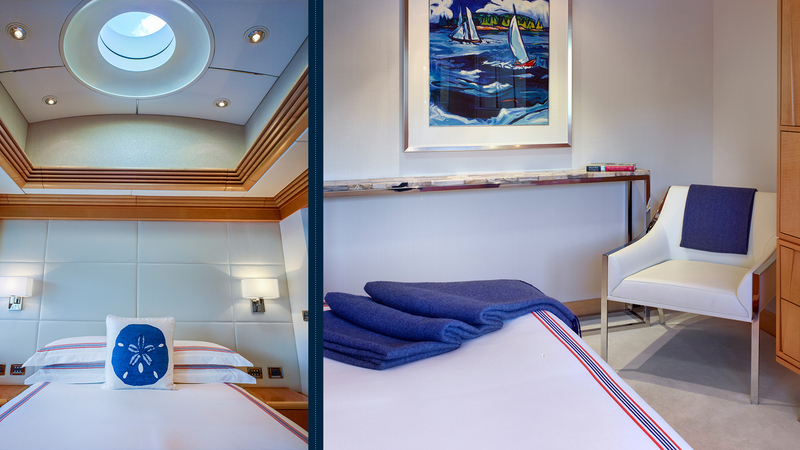 Main Deck Gym: Equipped with an elliptical machine, weight bench, free weights, yoga mats, blocks and straps, Bosu balls and resistance bands, the main deck gym also transforms into a tranquil massage room.